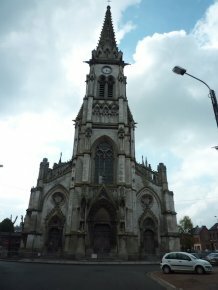 12/10/10 – Heritage – Abbeville, church Saint Jacques – Except for the local press, we were the first to talk about the church of Saint Jacques in Abbeville and the very serious threats to its existence (see article). At the time, early last summer, the hope was that the situation would improve. Indeed, according to the Collectif Saint-Jacques, an association for the protection of the church, the mayor had announced “that the property would be protected this winter” to allow for thought on its future without rushing to destroy it . This was in fact not true. Nothing has been done to protect it from the elements, particularly the hole in the roof. In fact, it seems that city hall prefers to let it deteriorate and then present its destruction as a fait accompli. Rumors were flying that a demolition was planned for 6 October, although it never took place. When we called city hall they said that a decision has not yet been made. We have our doubts. The church’s architectural importance can easily be seen from the photographs, one of the rare monuments left standing in the city after surviving both world wars. There is no doubt that the building deserves to be listed as a historical monument and not be victimized by municipal vandalism. If the church does end up being destroyed, we hope everyone will remember the mayor’s name : Nicolas Dumont. See the wabsite Patrimoine en blog.